Vegetarian Swedish Meatballs. Tasty meatballs without the meat. Packed with protein and full of flavor. Serve in cream sauce over noodles. Hi. It’s Lois in the kitchen at Recipe Idea Shop. 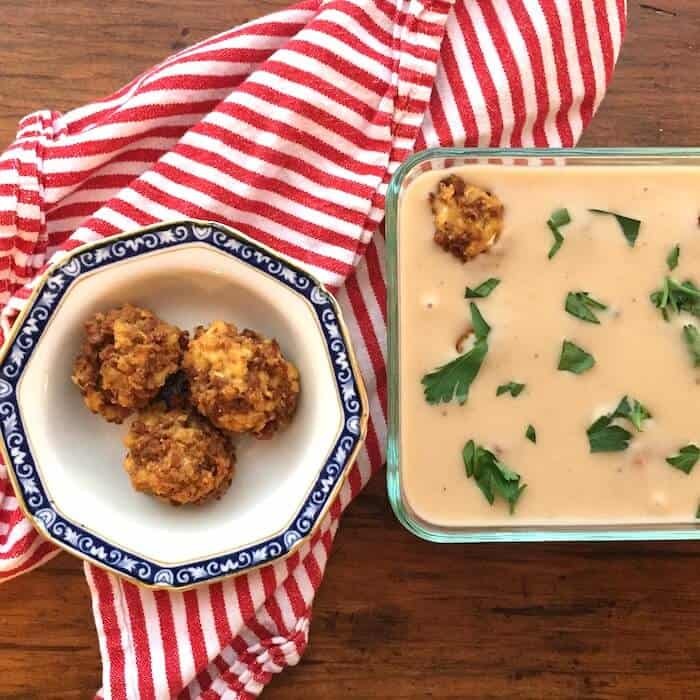 I made these Vegetarian Swedish Meatballs a few years ago for my daughter Erin and her partner Julie. 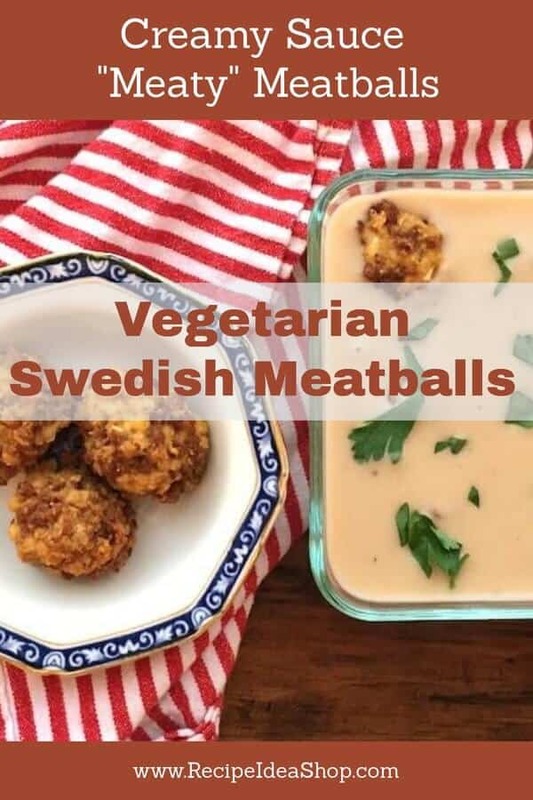 Julie is vegetarian, and Erin loves Swedish Meatballs, so I modified my standard Swedish Meatballs recipe to be vegetarian using vegetarian crumbles and tofu. The amount of protein in this meal is awesome. The recipe makes about 36-40 meatballs, and you can freeze some of them to use later. Le Creuset Heritage Stoneware 2-1/2-Quart Covered Square Casserole, White. Look at the other colors and buy it on Amazon. 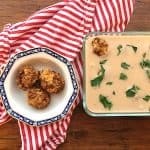 Delicious, "meaty" vegetarian meatballs in a creamy sauce. Dairy free and gluten free. Mix all the meatball ingredients until thoroughly mixed. Shape mixture into 2-inch balls. Cook uncovered in 350-degree oven until lightly browned, about 30-40 minutes. Melt margarine/butter in a saucepan, stir in flour. Cook over low heat, stir constantly until mixture forms little balls. Slowly add the cashew milk and water. Continue stirring, add the bouillon and salt. Heat to boiling and continue to stir until the sauce is a thick gravy. Place the meatballs in a glass casserole dish, cover with the sauce, sprinkle with snipped parsley and heat for 2 minutes in the microwave. Alternatively, you could bake the meatballs in the sauce in the oven for about 15 minutes at 350F degrees. Serve over cooked wide noodles with a green vegetable on the side. Vegetarian Swedish Meatballs Nutrition. Each serving is about 4 meatballs, 1/3 cup sauce and 1 cup noodles.